"Oskara has captured and handcuffed (behind their backs), two prisoners. 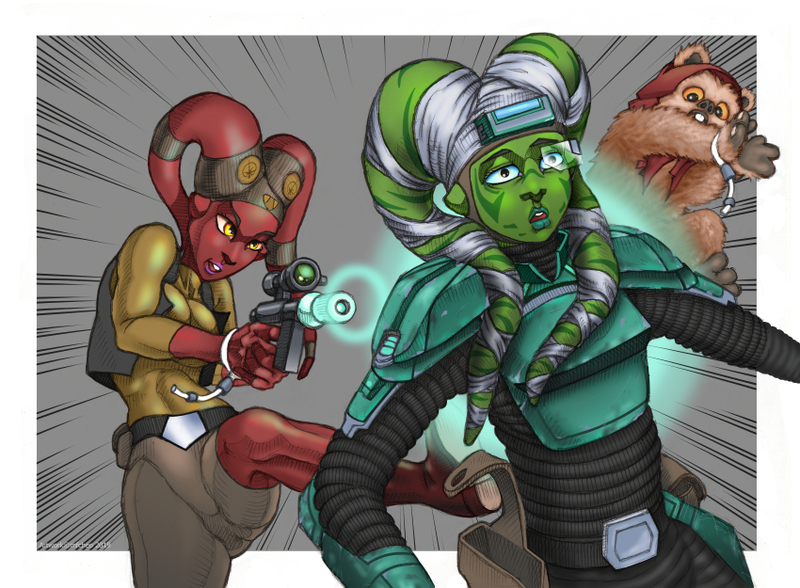 One is an "innocent bystander" female Twi'lek and the other, a VIP Ewok, my actual target. While Oskara is piloting the small ship off of Endor, the handcuffed Twilek moves in and STEALS Oskara's blaster and shoots her at point blank range on stun! (My wife rolled TWO TRIUMPH for this!). While Oskara is briefly stunned, the Twilek handcuffs Oskara and takes control of the ship. She then radios out a message, "tell Jabba I have both Oskara AND the Ewok alive. I'll be arriving shortly". I was trying to capture the Ewok for TEEMO the Hutt. What a wild twist of events. It was the best double cross ever! The only other thing I'd like included is two triumph symbols included in the picture anywhere the artist chooses." NOTE: I just realized I was thinking they had been captured unkowingly when I read "..captured and handcuffed (behind their backs)". I based Oskara loosely on the reference provided which I believe is the excellent work of Anthony Foti. Great picture. The suprise look on the pilot's face and the Ewok are priceless. I tried the new version of Star Wars roleplaying game and I did not care for it but that is just me. I mean jeez, whats wrong with 20,12, 8 4 sided dice? (There are so many cool varieties out there to personalize your own set) Maybe a reason why I've never played the SW RPGs.